The Grand National, like the London Marathon or the Boat Race, is a unique test. 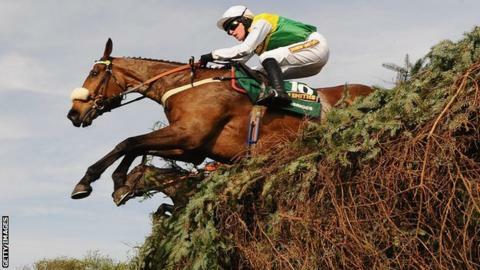 At no other time will a racehorse be asked to jump 30 green spruce fences of varying sizes over four and a half miles. Fitness is key so the work will have been piling up since February. Some trainers do a lot of slow work over two miles or so - never up to the full race distance - while others do shorter spurts of faster work, known as interval training. David Pipe, for example, has been sending Junior out on his uphill five-furlong gallop twice on work days at a decent clip. Some trainers test their horses' bloods, scope them to check their airwaves are clear, take their temperatures and weigh them daily to assess their well-being. Others use a less scientific method that they struggle to describe but just seem to know a horse is cherry ripe. Both systems work and the truly great trainers achieve the delicate balance between science and art. Nicky Henderson, who thinks he has his best chance of winning the National with Shakalakaboomboom, likes to school his horses over show jumps with the British three-day event team manager Yogi Breisner. Showjumping teaches a horse to use his back and to get his hocks (his back elbows) right under him so that he powers up and over the fences. Other trainers will manufacture so that their runner won't be thrown off stride by the unusual fences. Horses who have run well in the Grand National tend to do so again and again because they know what to do and how to cope. Ballabriggs, Black Apalachi, State of Play and Mon Mome all fall into that category and will need little specialist schooling to get them right. Sometimes a horse can do too much jumping and become too casual but it's crucial that when he meets the first fence after a thundering gallop from the start, he knows what to do. The best Aintree horses are nimble and clever, not over-bold. The ground will play a crucial factor and if the recent rain continues, as does West End Rocker. It is, as always an open race and has plenty of decent stories. Katie Walsh or Nina Carberry could become the first woman to win the National; Synchronised aims to be the first since Golden Miller in 1934 Mon Mome could win again at long odds or Ballabriggs emulate Red Rum with back-to-back wins for his late trainer Ginger McCain's son Donald. I have been honoured to follow a very select band of Grand National presenters and have achieved my ultimate ambition in fronting the biggest day's jump racing in the world. We have always tried to tell the stories that give people a reason to care and allow the huge audience to get close to the horses. This year will be no different and I will certainly try my best to take the BBC coverage out in style.